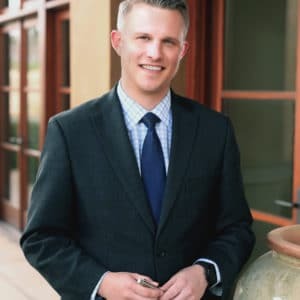 Abeyta Nelson Injury Law is pleased to welcome Brett Goodman as the newest attorney in the firm, where he will assist in a range of cases, including auto accidents and personal injury. “We are delighted to have Brett join our team at Abeyta Nelson Injury Law,” said Terry Abeyta, law firm founder and senior partner. “Brett’s years as a civil litigator allowed him to serve clients in the areas of commercial, estate, and real property litigation. He will put that expertise to work in our personal injury practice, ensuring that our clients are compensated for their medical bills and wage loss, so they can get back on their feet financially,” Abeyta added. Brett has deep personal and professional ties to the Yakima Valley, where he was born and raised. After graduating from West Valley High School, he went on to earn a Bachelor of Arts in psychology from Western Washington University. Brett attended the University of Idaho School of Law, where he was selected as a member of the D. Craig Lewis Trial Team, giving him the opportunity to complete in local and regional mock trial competitions. Brett graduated from law school with pro bono honors, having completed over eighty hours of pro bono service as a law student. Brett is a member of the Washington State Bar Association, and a member of the United States District Court for the Eastern and Western Districts of Washington. Brett has a passion for helping clients who have been wronged. He has defended indigent persons charged with crimes in Yakima County, and has provided pro bono legal services to low income clients through the Yakima County Volunteer Attorney Services. Brett also serves as treasurer of the Yakima County Bar Association. In his spare time, Brett enjoys traveling, distance running, golfing, exploring the beauty of the Pacific Northwest, and spending time with family and friends. Since 1981, Abeyta Nelson Injury Law has been highly regarded and ranked as a top personal injury law firm in Washington state serving clients through offices in Yakima, Ellensburg and Sunnyside. Abeyta Nelson attorneys represent clients in matters related to personal injury, auto accidents, truck accidents, wrongful death, brain or spinal cord injuries, uninsured motorist cases, and more. See a full list of practice areas by clicking here. If you need help, contact us AT injurylaw@abeytanelson.com or call us toll free at 800.927.2845.